Rev. Dr. Brian Konkol guides, nurtures and enhances religious, spiritual and ethical life at Syracuse University and across its extended community. 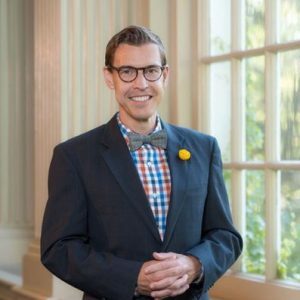 Appointed Dean of Hendrick’s Chapel in 2017, Konkol works to strengthen the role of the chapel as the spiritual heart of the campus and a model for diversity and inclusion of philosophies and religions. Konkol comes to Syracuse from Gustavus Adolphus College in St. Peter, Minnesota, where he served as chaplain of the college since 2013. In this role, he provided strategic leadership to the Office of the Chaplains and was a faculty member of the Peace, Justice and Conflict Studies program. Konkol, an ordained minister of the Evangelical Lutheran Church in America (ELCA), has a diverse and global background of service, ministry and teaching. Prior to his appointment to Gustavus Adolphus College, he served as co-pastor of Lake Edge Lutheran Church in Madison, Wisconsin, with responsibilities surrounding multicultural engagement and public advocacy. From 2008 to 2012, he served in South Africa as country coordinator of the Young Adults in Global Mission program of the ELCA. 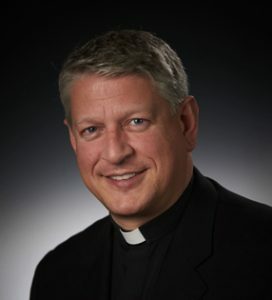 He also assisted in parish ministry alongside isiZulu-speaking congregations of the Evangelical Lutheran Church in Southern Africa, lectured at the Lutheran Theological Institute and participated with the World Council of Churches and Lutheran World Federation in the Conference of the Parties to the United Nations Framework Convention on Climate Change. David McCallum, S.J., Ed.D, is a Jesuit priest who serves as the Vice President for Mission Integration and Development at Le Moyne College in Syracuse, NY. He is an assistant professor of Management and Leadership, and served as both the interim dean of the Madden School of Business at Le Moyne, and the interim Vice President for Institutional Advancement at Le Moyne. His education includes a B.A. in English with Integral Honors from Le Moyne College, an M.A. in Philosophy from Fordham University, an M.Div. and a Pontifical License in Theology from the Weston Jesuit School of Theology, and an Ed.D. from Teachers College, Columbia University. Fr. McCallum serves as a facilitator for non-profit and educational strategic planning, provides developmentally informed coaching, and delivers leadership development programs and spiritual retreats internationally. He helped to found The Jesuit Collaborative (now the Office of Ignatian Spirituality) and the Contemplative Leaders In Action program for the Northeast Province of the Society of Jesus. He also helped to found and lead the Mission Integration Institute at the University of San Diego. His research interests include adult learning and development, group relations, leadership and organizational development, collaborative developmental action research, mission integration, and spiritual maturation.